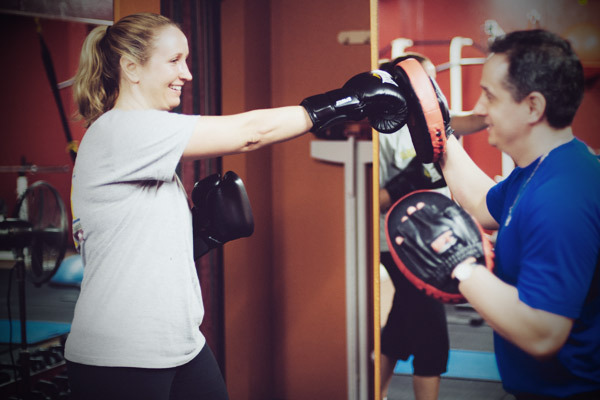 Everybody knows that kickboxing is great exercise, but they don’t always realize that classical style boxing gives an equally great workout! Art’s style is all about getting fit fast. One of his best students once asked, “Don’t you need to kick, too?” His answer was to put her through her first session of western boxing. While she was sweating and catching her breath, she managed a small “yeah” when he asked if the workout was okay. She left smiling — like all of his boxing students after each session — knowing that she was learning real fighting skills while getting the workout she craved. “I like the punching and hitting on the bag and pads,” she added. “It lets off steam and gets me physically and mentally fit!” Art also adds sport-nonspecific training equipment to build strength, speed, agility, and stamina. Common training equipment includes free weights, jump rope, and medicine balls for an overall balanced fitness workout. Art likes it to be extremely personalized and suitable to each individual’s goals and/or limitations, so he trains one-on-one or two-person shared sessions only. By appointment. Call to schedule. You’ll be glad you did!